Climb that mountain by bus or on foot? Stand or sit? Sneakers, smart going out shoes or boots? The choice is yours with the Triton smart ankle. Thanks to the option of adjusting the heel height to different shoes, gradual adaptation to sloped surfaces and a battery capacity of up to three days, you can go where and how you want to at your own pace. The Triton smart ankle adapts itself to changing walking speeds and slopes, and its built-in relief function also makes standing and sitting more natural and relaxed. Walking up and down ramps is noticeably easier. Learn more about the advantages the Triton smart ankle has to offer you below. Integrated Bluetooth® technology enables straightforward communication with an iOS or Android-based smartphone. These sensors make it possible to determine the angle of the ankle and its acceleration in space and provide important information to the microprocessor. The hydraulics control the ankle movement. Opening the valve enables plantar flexion or dorsiflexion of the ankle (lifting and lowering of the foot). 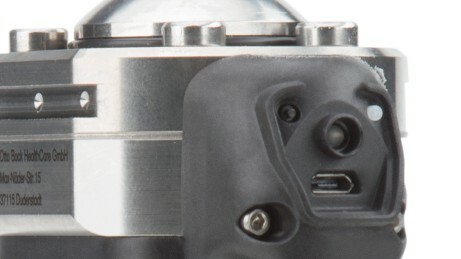 The battery and electronics are protected inside the ankle joint. The integrated microprocessor coordinates all measurement and control processes, thus calculating the correct adaptation of the ankle joint to the respective type of ground and your individual gait pattern. The data required for ankle adjustment is provided by integrated technology called Europa which measures the forces and moments affecting the prosthesis. 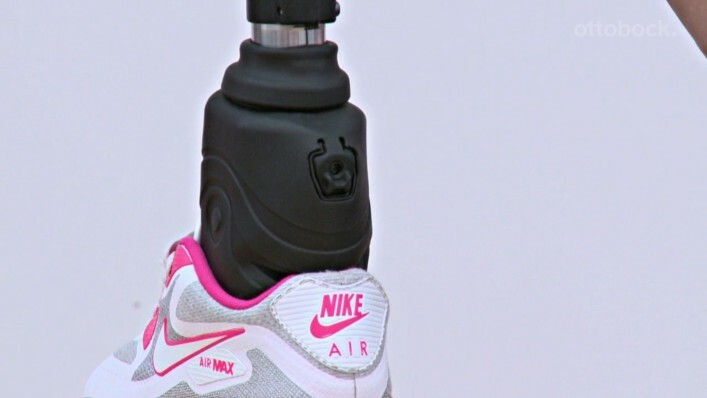 The prosthetic foot can be charged via a USB connection. Two buttons for manual operation as well as an optical LED status display are located directly above this. The interaction of the three carbon fibre spring elements ensures a very smooth transition between the individual gait phases. The split forefoot section provides the safety and control needed to deal with uneven ground and quick changes in direction. Thanks to the moving ankle joint, the Triton smart ankle facilitates walking on ramps and slopes as well as at different walking speeds. It uses its range of motion to adapt to the respective type of ground with every step. 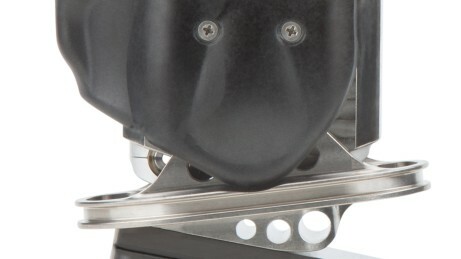 When sitting or when standing on slopes, the Triton smart ankle can lower towards the ground. This not only creates a more natural appearance, but also provides relief for your residual limb first and foremost. No matter whether barefoot, flat soles or heels – thanks to the heel height adaptation feature, you can stand and walk in a balanced, stable way in any shoes. And at the touch of a button, too. The Triton smart ankle can be operated easily and conveniently via smartphone app. An additional remote control is not needed. Besides the battery status and the heel height adaptation, the toe stiffness can be varied – to alter to a more relaxed or more dynamic walking style – or the free ankle motion enabled for a short time. During this time, you can move your foot into any position you like, which makes it easier to put on trousers in particular. 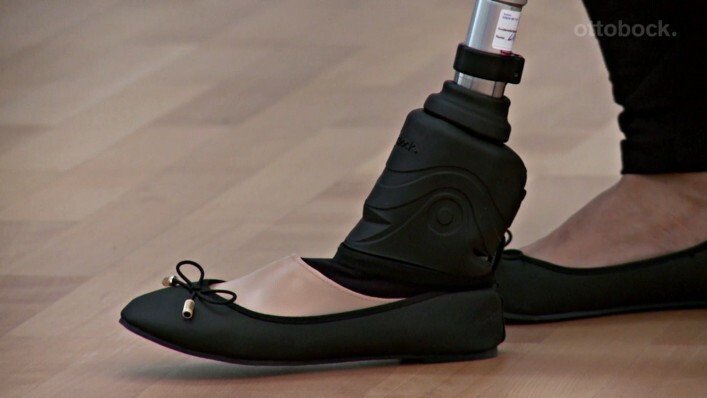 The Triton smart ankle is built around its carbon fibre spring, which not only gives you the desired dynamic movement but also unmistakably identifies the prosthetic foot as part of the Triton range. But what sets the Triton smart ankle apart from the other Triton feet is the highly sophisticated microprocessor technology enclosed in the ankle joint, which controls all of the processes that play a pivotal role in making everyday life easier. The sensors integrated into the foot send data to the microprocessor in order to identify required ankle angle adjustments. The resulting adaptations to plantar flexion or dorsiflexion make walking easier for you, not only on ramps, slopes and stairs, but also when walking at different speeds. This adaptation takes place gradually and the transitions from one terrain to another are very comfortable. In our online playlist, you’ll find helpful videos that show you how you can adjust and operate your Triton smart ankle manually with a button or via app. They demonstrate features such as heel height adaptation, relief function and free ankle movement. The user can switch on the relief function of the Triton smart ankle in a sitting or standing position. Following activation by relieving the foot for 2 seconds, the foot lowers itself to the desired flexed position. This provides for a more natural-looking appearance, full-surface contact with the floor and relief for the residual limb. 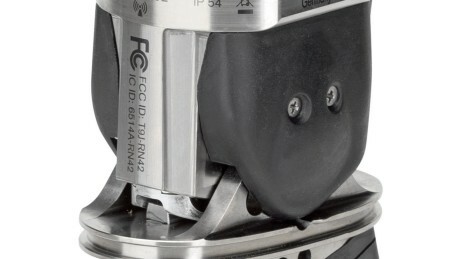 The user can manually adapt the Triton smart ankle to the new heel height after changing shoes. Put on the desired pair of shoes and press the white button on the back side of the ankle until a green LED is illuminated. 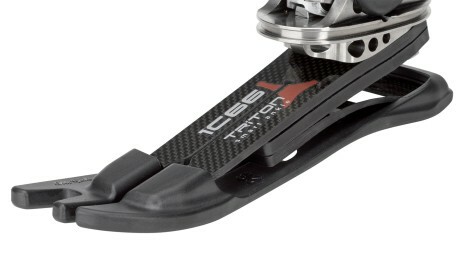 The new heel height is set by changing the angle in the ankle joint. 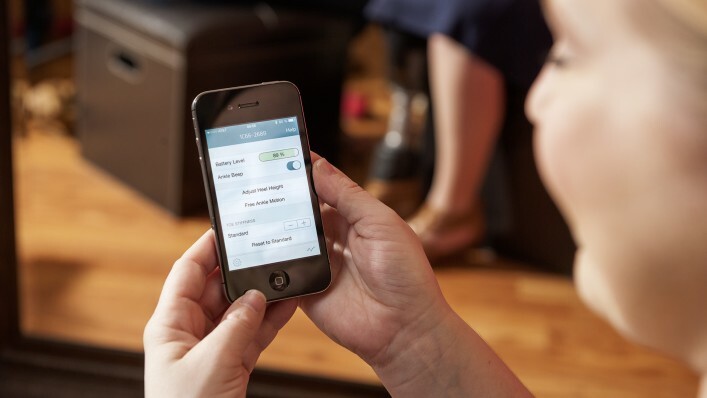 The user can use the Galileo app to adapt the Triton smart ankle to the new heel height after changing shoes. Put on the desired pair of shoes and follow the instructions in the app to perform the heel height adjustment. 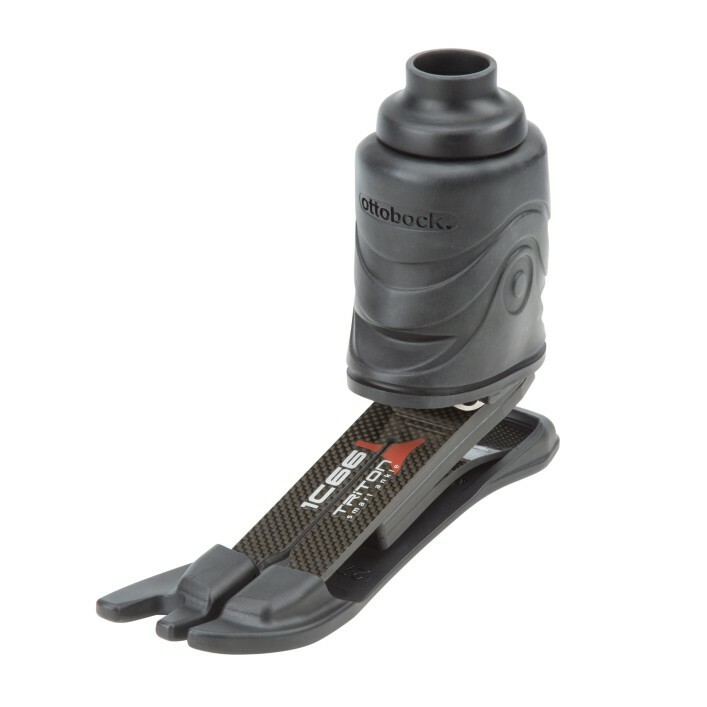 The ankle lock feature makes it possible to lock the ankle of the Triton smart ankle in a defined position. Extend the prosthetic foot forward so that the angle between the sole of the foot and the floor is at least 30°. Place a load on the forefoot area in this position for at least 2 seconds. 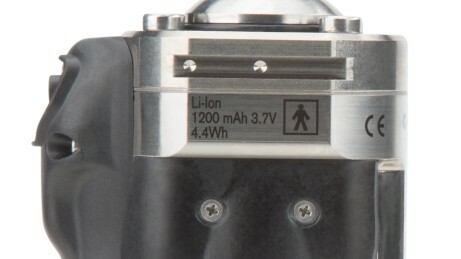 The LED only indicates the charging process if the prosthetic foot is switched on. Press the black button on the back side of the ankle to switch on the Triton smart ankle. The user can initiate the free ankle movement feature using the Galileo app. 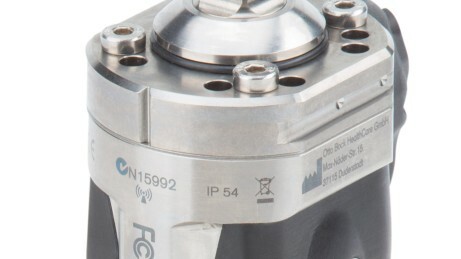 The valve of the hydraulics then opens for 15 seconds and the foot can be moved to the desired position (makes it easier to put on and take off trousers, for example).